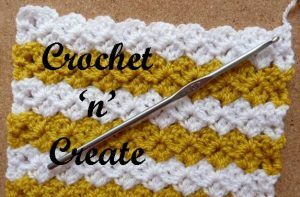 Just one pattern row in this lovely stitch, paris stitch is so very easy to do and there are so many projects you can make using it. I have written the instructions using two colors, but you can make in one solid color if you wish. If you would rather just skip my picture and print the paris stitch tutorial, scroll down the page to the PRINT icon at the bottom of the post. Make a chain length in multiples of 3 plus 4ch, work 1dc in 4th ch from hook, * skip 2ch, (2dc, ch2, 1sc) in next ch, * rpt from * to * last 3ch, skip 2ch, 2dc in last ch. Turn. Pattern Row – ch3, 1dc in base of ch3, (2dc, ch2, 1sc) in next ch2 space, * skip 2dc and sc, (2dc, ch2, 1sc) in next ch2 space, * rpt from * to * to end, skip 3dc, 2dc in top of ch3. Turn. Rpt Pattern Row changing color on every third row until you have the amount of rows you require. 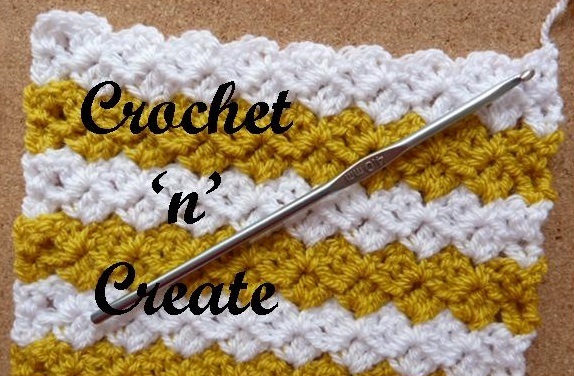 This entry was posted in Crochet Stitches and tagged crochet, crochet patterns, crochet stitches, free crochet patterns, free pattern on 30th September 2016 by Heather.